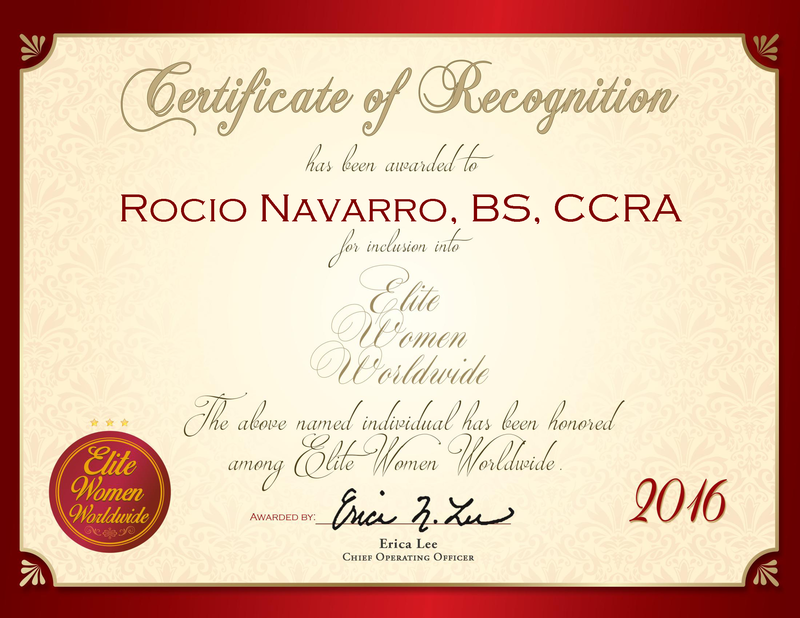 Silver Spring, MD, February 19, 2016, Rocio Navarro, Clinical Research Associate at INC Research, has been recognized by Elite Women Worldwide, for dedication, achievement and leadership in clinical development solutions. For more than a decade, Ms. Navarro has participated in conducting clinical studies and related roles to create safe and effective pharmaceutical drugs and treatments. Writing government contracts, ensuring patient safety and traveling all over North America, the Dominican Republic, Canada and Puerto Rico to guarantee human trials abide by federal and U.S. FDA regulations is all part of a day’s work for Ms. Navarro. In addition, she reviews boards and runs regional clinical trials for different pharmaceutical and technology companies. With an innate curiosity of science and a desire to make the world a better place, Ms. Navarro strives to ensure the ethical practice of medicine is applied. Upon graduating from college, she was offered, and accepted, a position in clinical research. She seeks new opportunities upon receiving a master’s degree in biotechnical management from the University of Maryland. She hopes advance to a senior-level position and expand her research to include the fields of oncology, biology and vaccines. Ms. Navarro became certified as a clinical research associate from the Association of Clinical Research Professionals. She maintains affiliation with the Biomedical Engineering Society, the Society of Clinical Research Associates and the Association of Clinical Research Professionals. This profession is one of the most aspects of her life and she enjoys seeing the positive results, connecting with nurses, doctors and staff. This connection with her work and colleagues allows her to proficiently field questions about drug combinations and the protocol for clinical trials.